Thomas Jefferson built Monticello over a forty-year span, beginning in 1769 when he was 26 years old. Construction of the building in its present configuration began in 1796 and was essentially complete by 1809 when Jefferson retired from the Presidency. 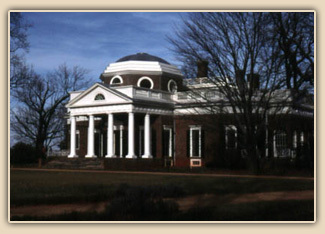 Monticello is presently administered by the Thomas Jefferson Memorial Foundation. For over twenty years, Welsh Color & Conservation, Inc. was integrally involved in the investigation, analysis and restoration of historic finishes at Monticello. Our participation extended into numerous projects throughout the building, including: the exposure, conservation and restoration of original painted graining on the doors; the characterization and restoration of sand painting on exterior portico columns and rustication; and the investigation, analysis, pigment identification, color evaluation and restoration of historic paints and wallpapers. Some of the most striking results of our efforts are found in the Dome Room and the Entrance Hall, where the bold original distemper paint colors have been evaluated and restored. Through decades of research and analysis, we have compiled a significant bank of information about the building's historic finishes and consulted firsthand in many aspects of restoration at Monticello. Several publications by Frank S. Welsh highlight our work at Monticello. See the Publications page of this web site for titles and bibliographic information (articles #6, 11, 17 and 19). View of the east front, or carriage entrance, at Monticello. 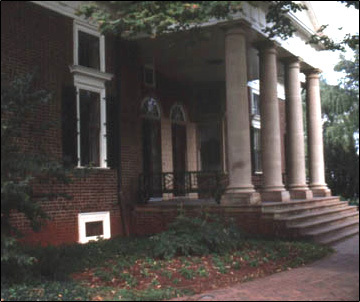 The original sand paint finish has been restored to the columns and the rustication under the portico. 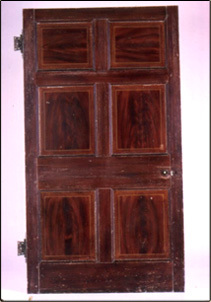 The original mahogany graining on this door was exposed after Frank S. Welsh carefully removed all later layers of paint. 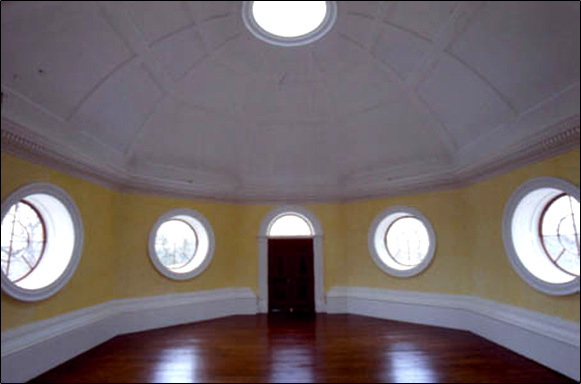 View of the Dome Room after restoration of the original yellow distemper paint on the walls and white on the trim. Though it is not pictured in this photo, the floor was originally painted dark green.